A Timeless Classic Updated and Enhanced for Modern Performance. Based in Stourbridge, we offer our market-leading uPVC casement windows throughout Worcestershire, Worcester, Redditch, Kidderminster, Bromsgrove, Droitwich Spa, Evesham, Birmingham, Coventry, Solihull, Wolverhampton, Dudley, Stafford and surrounding West Midlands areas. Casement windows have proven themselves to be a highly versatile uPVC window option, perfectly complementing both new and old properties alike. They have proven themselves to be a highly popular option amongst homeowners, achieving impressive levels of thermal efficiency, security, durability, and performance. These windows are manufactured using the latest techniques, combining premium grade materials and contemporary craftsmanship to ensure you bring a worthwhile investment into your home. They are available in a wide range of high quality colours and can also be fitted with a selection of high quality accessories. This means that you’ll be able to bring a personal touch, suited to you. To suit a wide range of tastes and needs, our uPVC casement windows can be fitted in a choice of uPVC profile styles. By utilising the market-leading designs from Profile 22, we are able to offer you a home improvement solution that excels in all areas. Optima Chamfered: Perfect for modern homes, the Optima Chamfered profile detailing brings a modern appeal that allows you to complement your home with a smooth and sleek feel. If you’re looking for something to bring a subtle flair to your property, look no further. Optima Sculptured: For homeowners looking for something with a more decorative feel, the Optima Sculptured offers a beautiful traditional feel. These windows are designed to emulate the look of traditional wooden windows, updated for the modern day. Flush: View our uPVC flush casement windows for more information on this style. We understand that bringing something new to your home is about more than just looks. This is why we invest in a design that achieves leading standards of thermal efficiency, security and durability to help increase the comfort and look of your home. With Carera Windows, you’ll be able to feel safer and warmer in your home without compromising on looks. Our uPVC casement windows are able to achieve exceptional standards of thermal efficiency, thanks to an innovative multi-chambered design. When this factor is combined with the superior weather seal, you’ll be able to enjoy A++ Window Energy ratings that will work to keep the cold air out and the warm air in during the Winter months. Further to this, the uPVC casement windows that we offer are ergonomically designed with you in mind. This means that they contain profile surfaces that are easy to clean and maintain, with the angled edges allowing rainwater to run-off, minimising dirt and debris build up. This means that you’ll be able to keep your home looking clean and fresh with minimal effort. The uPVC casement windows that we offer have undergone assessment by the British Board of Agrément. As one of the UK’s leading governing bodies of quality assurance, this certification allows you to enjoy the peace of mind that comes with better products. With Carera Windows, you’ll benefit from quality that continues to deliver time and time again. Our uPVC casement windows are installed with a central Eurogroove for extra rigidity and are manufactured using premium grade materials and modern techniques. Through this, they are able to achieve the Secured By Design certification. This initiative, backed by the Association of Chief Police Officers, assesses home improvement products for their crime prevention capabilities. Enhancing your home does not have to come at the cost of the planet. Our range of uPVC casement windows is made using a uPVC profile that is 100% recyclable, which means that it stands as a completely sustainable home improvement option. Further to this, these windows can achieve this standard without having to offer less quality as a result. Bringing a personal touch to your home is made easy with our wide range of colour options. 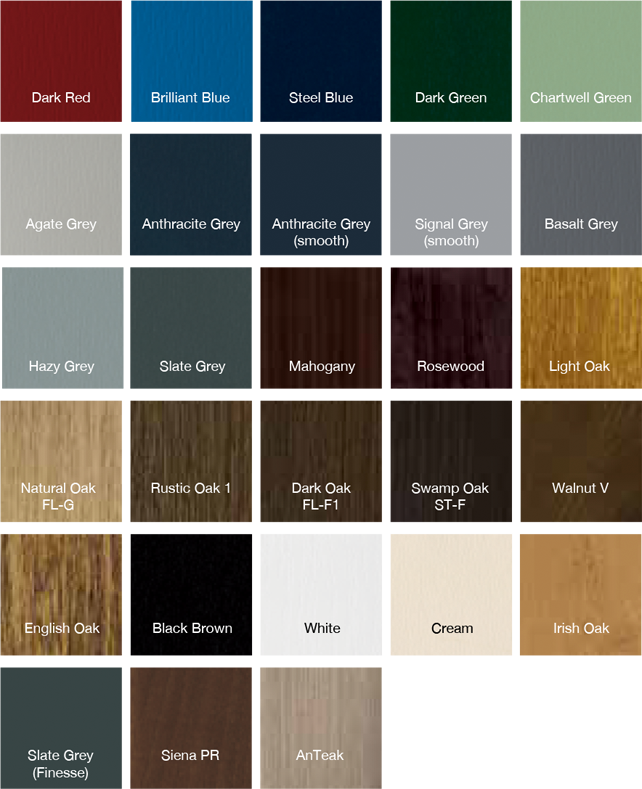 Choose from standard colours, or woodgrain foils, to bring the right look to your property. Whether you’re looking for something modern or classic, we’ll have something to suit what you’re after. All colours are fitted with a highly durable coating to ensure they don’t fade or peel over time. Looking for casement window prices in Worcestershire and the West Midlands? Visit our online quoting engine to get a free, instant and highly competitive uPVC casement windows quote. This system features a simple to follow step by step process that enables you to get a price based on your exact specifications. Alternatively, you can get in touch with us via our online contact form if you wish to speak to a member of our friendly team. We’ll be more than happy to help you to bring your ideal uPVC casement window to your home.